North–South partnerships for health aim to link resources, expertise and local knowledge to create synergy. The literature on such partnerships presents an optimistic view of the promise of partnership on one hand, contrasted by pessimistic depictions of practice on the other. Case studies are called for to provide a more intricate understanding of partnership functioning, especially viewed from the Southern perspective. 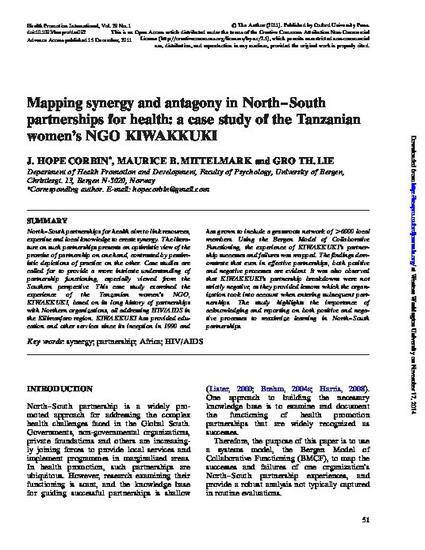 This case study examined the experience of the Tanzanian women's NGO, KIWAKKUKI, based on its long history of partnerships with Northern organizations, all addressing HIV/AIDS in the Kilimanjaro region. KIWAKKUKI has provided education and other services since its inception in 1990 and has grown to include a grassroots network of >6000 local members. Using the Bergen Model of Collaborative Functioning, the experience of KIWAKKUKI's partnership successes and failures was mapped. The findings demonstrate that even in effective partnerships, both positive and negative processes are evident. It was also observed that KIWAKKUKI's partnership breakdowns were not strictly negative, as they provided lessons which the organization took into account when entering subsequent partnerships. The study highlights the importance of acknowledging and reporting on both positive and negative processes to maximize learning in North–South partnerships.